A Preview of Craftsman Maker "V"
03/10/2019: Added a Hinsdale Chrome-Nickel "Mechanics" Socket Set. 03/14/2016: Updated case study for Billings, added a Craftsman 1031 Open-End Wrench. 03/13/2016: Added a Craftsman C-3006 Tappet Wrench. 02/17/2016: Added a Merit 1/2x9/16 Offset Box Wrench. 01/23/2016: Added a Craftsman 1/2x9/16 Box Wrench. 01/22/2016: Added a Craftsman 1/2 Flat Chisel. 01/21/2016: Added a Dunlap 5/8 Flat Chisel. 01/17/2016: Added a Craftsman Vanadium 3/8x7/16 Offset Box Wrench. 01/15/2016: Added a Merit 27 Open-End Wrench. 01/09/2016: Added a Craftsman "BC" Wood Chisel. 01/08/2016: Added a Craftsman Vanadium Short Offset Box Wrench. 12/30/2015: Added a Fulton 100 S-Shaped Open-End Wrench and Craftsman 5781-8 Button's Pliers. 12/27/2015: Added Craftsman 8.5 Inch Lineman's Pliers. 12/23/2015: Added Craftsman 5783-5 Diagonal Cutters. 12/22/2015: Added Craftsman 8 Inch Assembly Pliers. 12/18/2015: Added a Craftsman Vanadium "AF" 1027 Wrench and Craftsman 7 Inch Diagonal Cutters. 12/16/2015: Added Craftsman 8.5 Inch Lineman's Pliers. 12/15/2015: Reorganized box wrench section. 12/13/2015: Added Craftsman 8 Inch Needlenose Pliers. 12/11/2015: Updated Billings case study for "AF" and "CI" codes. 12/09/2015: Added a Craftsman 1027 Open-End Wrench and Craftsman Vanadium Combination Pliers. 12/07/2015: Added an Early Craftsman C-1031 Open-End Wrench, a Craftsman Vanadium 1033C Open-End Wrench, and an Early Craftsman X30 Short Offset Box Wrench. 12/06/2015: Added review of the 1938-39 Fall-Winter catalog, added a Dunlap "Bet'R-Grip" Adjustable Wrench and rare early Craftsman 5797-5.5 Combination Pliers. 12/04/2015: Added a Merit 2729 Obstruction Wrench. 12/03/2015: Added a Craftsman No. 3 "Curved Arc" Tappet Wrench and a Merit 31 "AF" Open-End Wrench. 11/19/2015: Added a Merit 6-Piece Wrench Set ... made by Billings & Spencer! 12/24/2011: Added a Craftsman 3/8x7/16 Short Offset Box-End Wrench. 12/19/2011: Reorganized sections, moved catalog reviews to Appendix A. 12/18/2011: Added a Craftsman 3/4-Drive 1-1/2 Socket. 12/17/2011: Added a Merit 10 Inch Adjustable Wrench. 12/15/2011: Added a Craftsman Vanadium  Transitional Socket Set. 12/14/2011: Added a Craftsman "V" No. 1 Tappet Wrench. 12/11/2011: Added a Sears Autokit No. 1 Socket Set. 12/08/2011: Minor update to catalog reviews. 11/28/2011: Added a Early Fulton 5/8x11/16 S-Shaped Wrench. 11/26/2011: Added a Craftsman 3/4x7/8 Offset Box-End Wrench. 11/24/2011: Added a Craftsman "Vanadium Steel" Open-End Wrench. 11/17/2011: Added a Craftsman "BT" Ballpeen Hammer. 10/31/2011: Added Craftsman Vanadium Angle-Nose Gripping Pliers. 10/23/2011: Added Craftsman 9 Inch Button's Pattern Pliers. 10/22/2011: Added a Craftsman Vanadium 1723 Open-End Wrench. 10/16/2011: Added a Fulton "AD" Monkey Wrench. 10/11/2011: Added a Craftsman "CI" No. 1 Tappet Wrench. 10/09/2011: Added a Craftsman Vanadium 1/2x9/16 Box Wrench. 10/01/2011: Added Fulton Thin-Nose Combination Pliers. 09/13/2011: Added Fulton 6216 Half-Moon Box Wrench. 09/02/2011: Added a Craftsman Vanadium "AF" No. 3 Tappet Wrench. 08/17/2011: Added Craftsman Vanadium 7 Inch Lineman's Pliers. 08/14/2011: Added a Craftsman Vanadium "AF" 1031 Open-End Wrench. 06/18/2011: Added Merit Bent Thin-Nose Combination Pliers. 06/13/2011: Added Dunlap 7 Inch Lineman's Pliers. 06/10/2011: Added a Craftsman "CI" No. 1 Tappet Wrench. 06/05/2011: Added a Craftsman "Chrome-Vanadium" C-1729 Open-End Wrench. 05/30/2011: Added a Craftsman Vanadium "CI" 13/16x7/8 Box Wrench. 05/27/2011: Updated manufacturer's codes table. 05/22/2011: Added Merit Bent Thin-Nose Combination Pliers. 05/17/2011: Added a Craftsman Vanadium 3/8-Drive 13/16 Socket. 05/16/2011: Added a Craftsman Vanadium "9-Piece" Socket Set. 05/15/2011: Added a Craftsman 3/4-Drive 1-1/4 Socket. 05/12/2011: Added a Craftsman 3/4-Drive 1-1/8 Socket. 05/11/2011: Added a Craftsman 3/4-Drive 1-5/8 Socket. 05/10/2011: Added a Craftsman Vanadium 4 Inch Adjustable Wrench and a Craftsman Vanadium "BC" Pin Punch. 05/09/2011: Added a Craftsman Vanadium "AF" 5/8x11/16 Offset Box Wrench. 05/05/2011: Added a Craftsman Vanadium 1729 Open-End Wrench and a Craftsman Vanadium "AF" 1/2x9/16 Offset Box Wrench. 05/04/2011: Added a Craftsman "K-Circle" 1/2-Drive Universal. 05/03/2011: Added a Craftsman Vanadium 1725B Open-End Wrench, Craftsman 5783-6 Diagonal Cutters, and a Craftsman Vanadium 8 Inch Adjustable Wrench. 05/02/2011: Added a Craftsman "Chrome-Vanadium" C-1731 Open-End Wrench. 04/30/2011: Added a 1922 Listing for Aristocrat No. 1 Socket Set and a Listing for Chicago Manufacturing Socket Set. 04/29/2011: Added section for pre-Craftsman tools, added a Listing for Aristocrat No. 1 Socket Set. 04/28/2011: Added a Craftsman Early "Chrome-Vanadium" C-1025 Open-End Wrench and a Craftsman "BT" 1/2-Drive Reversible Ratchet. 04/26/2011: Added a Craftsman Vanadium 1731 Open-End Wrench. 04/25/2011: Added a Craftsman Vanadium "AF" 3/4x25/32 Offset Box Wrench. 04/24/2011: Added a Craftsman Vanadium 1033C Open-End Wrench. 04/23/2011: Added a Craftsman Vanadium 1723 "AF" Open-End Wrench and a Craftsman "V" No. 4 Tappet Wrench. 04/22/2011: Added a Craftsman C-Series "37-Piece" Socket Set and a Fulton "Tool Steel" Adjustable Wrench. 04/20/2011: Split into four pages. 04/16/2011: Added a Craftsman "BM" 3/4-Drive Sliding Tee Handle. 04/15/2011: Added a Craftsman 1031 "CI" Open-End Wrench. 04/12/2011: Added a Cross Country 9/16x5/8 Battery Wrench. 04/09/2011: Added a Merit 6-8 Inch Adjustable Wrench. 04/06/2011: Added a Craftsman Vanadium "AF" 1/2x9/16 Offset Box Wrench. 03/28/2011: Added Craftsman Vanadium 6 Inch Long Nose Pliers. 03/26/2011: Added a Craftsman Vanadium "AF" 5/8x11/16 Short Box Wrench. 03/24/2011: Minor reorganization of history section. 03/20/2011: Added a Craftsman 1020 "CI" Open-End Wrench. 03/13/2011: Added Dunlap Bent Thin-Nose Combination Pliers. 03/08/2011: Added a Craftsman "CI" 5/8x11/16 Short Offset Box Wrench. 02/25/2011: Added a Craftsman 1033C "CI" Open-End Wrench, updated photo for Craftsman 1/2-Drive C-97 Ratchet. 02/24/2011: Added a Craftsman C-93 1/2-Drive Flex Handle. 02/23/2011: Minor reorganization in socket tools section. 02/17/2011: Added a Merit "Bet'R-Grip" 10 Inch Adjustable Wrench. 02/15/2011: Added a Craftsman Vanadium "CI" 1020 Open-End Wrench. 02/14/2011: Added a Craftsman Vanadium "CI" 1031 Open-End Wrench. 01/27/2011: Added Fulton 6 Inch Thin-Nose Combination Pliers. 01/23/2011: Updated review for 1930 Spring and Summer catalog. 01/22/2011: Added a Craftsman Vanadium 25/32x13/16 Offset Box Wrench. 01/21/2011: Added a Craftsman Vanadium "CI" 1/2 Combination Wrench. 01/17/2011: Added Craftsman Vanadium 6 Inch Electrician's Pliers. 01/15/2011: Added a Craftsman Vanadium 4 Inch Adjustable Wrench. 01/08/2011: Added a Craftsman Vanadium 4 Inch Adjustable Wrench. 01/03/2011: Added a Merit 2022A Obstruction Wrench. 12/26/2010: Added Craftsman Vanadium 8.5 Inch Lineman's Pliers. 12/18/2010: Added a Craftsman Vanadium 1723 Open-End Wrench. 12/14/2010: Added an Early Craftsman Vanadium 5/8x11/16 Offset Box-End Wrench. 12/11/2010: Added a Craftsman Vanadium 1027 Open-End Wrench and Craftsman Vanadium 6 Inch Adjustable Wrench. 12/01/2010: Added a Craftsman "Vanadium Steel" C-1027 Open-End Wrench. 11/28/2010: Added summary table of Craftsman catalog listings, reorganized box wrench section, added a Craftsman Vanadium "AF" 3/8x7/16 Short Offset Box Wrench. 11/26/2010: Added Craftsman Early Diagonal Cutters. 11/24/2010: Added a Cross Country Offset Box Wrench. 11/23/2010: Added a Craftsman C-92 1/2-Drive Speeder. 11/19/2010: Added a Craftsman C-90 1/2-Drive Extension. 11/14/2010: Split sections on pliers and adjustable wrenches. 11/07/2010: Added a Craftsman "Vanadium Steel" 1727 Open-End Wrench. 11/06/2010: Added a Craftsman Vanadium 1729 Open-End Wrench. 11/02/2010: Added a Craftsman Vanadium 1031 Open-End Wrench. 11/01/2010: Added a Cross Country No. 2 Tappet Wrench. 10/31/2010: Added a Craftsman "Vanadium Steel" C-1723 Open-End Wrench and a Craftsman No. 4 Tappet Wrench. 10/29/2010: Added a Craftsman "CI" 5/8x11/16 Short Box Wrench. 10/18/2010: Added a Craftsman C-91 1/2-Drive Extension. 10/12/2010: Added a Cross Country Offset Box Wrench. 09/23/2010: Added a Craftsman "CI" 1-1/16x1-1/4 Offset Box-End Wrench. 09/22/2010: Added a Craftsman "Vanadium Steel" 1033-C Open-End Wrench. 09/15/2010: Added a Craftsman Vanadium "AF" 1033C Open-End Wrench. 09/11/2010: More updates to the catalog reviews. 09/07/2010: Added a Craftsman Vanadium "AF" 11/16 Combination Wrench. 09/05/2010: Added a Craftsman Vanadium "CI" No. 3 Tappet Wrench. 09/03/2010: Added a Craftsman Vanadium "AF" 9/16 Combination Wrench and a Craftsman "CI" 3/4 Combination Wrench. 09/01/2010: Updated catalog review for 1938. 08/31/2010: Added a Craftsman Vanadium 3/8x7/16 Offset Box Wrench and a Craftsman Vanadium "AF" 5/8 Combination Wrench. 08/30/2010: Added a Craftsman Vanadium "AF" 7/16 Combination Wrench. 08/27/2010: Added a Craftsman "CI" 3/8x7/16 Box-End Wrench and a Duro-Bilt 20-Piece 1/2-Drive Socket Set. 08/26/2010: Updated catalog review for 1932, added a Craftsman Vanadium "AF" 1/2 Combination Wrench. 08/24/2010: More catalog review updates. 08/23/2010: Updated catalog review for 1929. 08/21/2010: Added a Duro Metal Products "Double Guarantee" 1/2-Drive Socket Set and a Duro No. 600 1/2-Drive L-T Handle. 08/18/2010: Added a Duro-Bilt 1/2-Drive Socket Set. 08/09/2010: Added a Craftsman "CI" No. 3 Tappet Wrench. 08/06/2010: Added a Craftsman Vanadium 8 Inch Adjustable Wrench. 07/30/2010: Added a Craftsman 1731 "CI" Open-End Wrench. 07/22/2010: Started review of 1933 catalog. 07/21/2010: Added Craftsman 8.5 Inch Lineman's Pliers and a Dunlap "CI" Open-End Wrench. 07/17/2010: Added Craftsman "Vanadium" 5 Inch Diagonal Cutters and Craftsman "Vanadium" 6 Inch Diagonal Cutters. 07/15/2010: More catalog review updates. 07/12/2010: Added a Fulton "Vanadium" Offset Box Wrench. 07/10/2010: Added Craftsman 9 Inch Button's Pattern Pliers. 06/30/2010: Added Craftsman "Vanadium" End Nippers and Dunlap 6 Inch Combination Pliers. 06/26/2010: Expanded catalog review, added a Craftsman "Vanadium Steel" C-1731 Open-End Wrench. 06/19/2010: Added a Craftsman Vanadium 10 Inch Adjustable Wrench. 06/05/2010: Added a Craftsman Vanadium 1729 "CI" Open-End Wrench. 05/15/2010: Added Craftsman "BT" 1/2-Drive Ratchet. 05/01/2010: Added Dunlap Battery Pliers. 10/20/2009: Added Craftsman Early Battery Pliers. 10/04/2009: Added Craftsman Early Button's Pattern Pliers. 10/01/2009: Added a Craftsman Vanadium 3/8x7/16 Box Wrench. 09/26/2009: Added a Craftsman Early Vanadium Offset Box Wrench. 09/20/2009: Added Dunlap 6 Inch Needlenose Pliers. 08/27/2009: Added Craftsman 7 Inch Lineman's Pliers. 08/26/2009: Added a Dunlap 8 Inch Auto Wrench. 08/19/2009: Added a Craftsman "Vanadium Steel" C-1729 Open-End Wrench. 08/15/2009: Added Dunlap 5-1/2 Inch Combination Pliers. 08/03/2009: Added Dunlap "Approved" 8 Inch Pliers. 07/19/2009: Added a Craftsman Vanadium 1033C Open-End Wrench and a Dunlap "Approved" 8 Inch Pipe Wrench. 07/17/2009: Added a Craftsman Vanadium "CI" 5/8x3/4 Box Wrench. 06/29/2009: Added a Craftsman Vanadium "CI" 5/8x11/16 Offset Box Wrench. 06/22/2009: Added a Craftsman Vanadium "CI" 15/16x1 Offset Box Wrench. 06/17/2009: Added a Craftsman Vanadium "CI" 13/16x7/8 Offset Box Wrench. 06/14/2009: Added Craftsman Vanadium 7 Inch Diagonal Cutting Pliers and Dunlap Battery Pliers. 06/04/2009: Added Craftsman Vanadium 6 Inch Needlenose Pliers. 04/16/2009: Added a Craftsman HD4 Offset Box Wrench. 04/14/2009: Added a Craftsman Vanadium "CI" 3/4x25/32 Offset Box Wrench. 04/13/2009: Added a Craftsman Vanadium "CI" Short Offset Box Wrench. 04/12/2009: Added Merit 10 Inch Waterpump Pliers. 04/10/2009: Added a Fulton 19/32x11/16 Open-End Wrench. 04/09/2009: Added a Craftsman "Vanadium Steel" C-1033-C Open-End Wrench and a Craftsman "CI" Offset Box Wrench. 04/05/2009: Added a Craftsman Vanadium "CI" 9/16 Combination Wrench and a Craftsman "CI" 11/16 Combination Wrench. 04/04/2009: Started revising box wrench and socket sections, added a Fulton 1/2-Drive Socket Set. 04/03/2009: Added a Merit 729 "AF" Open-End Wrench. 04/01/2009: Split into three pages, added a Craftsman Vanadium "CI" 1723 Open-End Wrench, a Craftsman "CI" 1027 Open-End Wrench, and a Craftsman Four-Way Offset Screwdriver. 03/31/2009: Added a Craftsman Vanadium Short Box Wrench and a Craftsman Vanadium 6 Inch Adjustable Wrench. 03/29/2009: Updated catalog review, added a Craftsman Vanadium Cotter Pin Puller. 03/28/2009: Added a Craftsman Vanadium "CI" Box Wrench. 03/16/2009: Added a Merit 27 "AF" Open-End Wrench. 03/15/2009: Added a Craftsman Vanadium "AF" Box Wrench. 03/10/2009: Added a Dunlap 3/8x7/16 Ratcheting Box Wrench. 03/08/2009: Added a Dunlap 1/2x9/16 Ratcheting Box Wrench. 12/17/2008: Added Craftsman "Vanadium" End Nippers. 10/28/2008: Added a Craftsman "Vanadium Steel" Open-End Wrench. 10/05/2008: Added a Dunlap Open-End Wrench Set. 08/03/2008: Added a Craftsman Vanadium Short Box Wrench. 05/10/2008: Added a Merit 2031 Obstruction Wrench. 04/27/2008: Added a Merit 2027 Obstruction Wrench. 04/22/2008: Added a Merit 2725B Obstruction Wrench. 04/16/2008: Added a Craftsman Vanadium "CI" 1725B Open-End Wrench. 04/11/2008: Added a Merit "AF" 3/8x7/16 Open-End Wrench. 04/03/2008: Added a Merit "AF" 19/32x11/16 Open-End Wrench. 03/20/2008: Added a Craftsman "CI" 1/2x9/16 Box-End Wrench. 03/10/2008: Added a Craftsman 3/4 Combination Wrench. 12/04/2007: Added a Craftsman "CI" Offset Box Wrench. 11/28/2007: Added a Craftsman Vanadium "CI" No. 2 Tappet Wrench. 11/12/2007: Added Craftsman Vanadium Wrench Pliers. 11/10/2007: Added a Craftsman Vanadium "AF" No. 2 Tappet Wrench. 10/29/2007: Added a Craftsman "CI" No. 2 Tappet Wrench. 10/28/2007: Added a Craftsman Vanadium "CI" Offset Box Wrench. 10/05/2007: Added a Craftsman Vanadium 1027 "CI" Open-End Wrench. 10/04/2007: Added a Craftsman Vanadium "CI" Offset Box Wrench. 09/30/2007: Added a Dunlap Open-End Wrench. 09/28/2007: Added a Craftsman 1090F Tappet Wrench. 09/26/2007: Added a Dunlap Open-End Wrench. 09/18/2007: Added a Craftsman Vanadium 1725B "AF" Open-End Wrench. 08/25/2007: Added a Craftsman Vanadium 1729 "AF" Open-End Wrench. 08/23/2007: Added a Craftsman Vanadium 1731 "CI" Open-End Wrench. 08/20/2007: Added a Craftsman Early Chrome-Vanadium Open-End Wrench. 07/02/2007: Added a Craftsman 1725B "CI" Open-End Wrench. 05/18/2007: Added a Craftsman Vanadium Adjustable Wrench. 02/26/2007: Added a Craftsman 1020 Open-End Wrench. 01/22/2007: Added a Craftsman 1031 "CI" Open-End Wrench. 12/13/2006: Added a Craftsman 1725B "CI" Open-End Wrench. 11/25/2006: Added a Craftsman "CI" Short Box-End Wrench. 11/18/2006: Added a C-36 1/2-Drive Socket and a group of C-0xx 1/2-Drive 8-Point Sockets. 11/06/2006: Added a Craftsman "CI" 9/16 Combination Wrench. 10/14/2006: Renumbered figures, added link to Duro-Bilt Socket Set. 08/27/2006: Added a Craftsman Vanadium "AF" Open-End Wrench. 08/12/2006: Added a Craftsman "V" Combination Wrench. 08/07/2006: Added a Dunlap Center Punch. 08/06/2006: Added a Craftsman "V" Open-End Wrench. 08/05/2006: Added a Craftsman 1092-F Tappet Wrench. 07/27/2006: Added a Craftsman "X 1" Box-End Wrench. 07/13/2006: Added Craftsman Transitional Wrench Pliers. 07/09/06: Added CI and Vanadium 15/16x1 Offset Box-End Wrenches. 07/06/06: Added a 1/2-Drive C-93 Flex-Head Handle. 07/05/06: Added a 3/8-Drive CF-16 Socket. 07/04/06: Added a Craftsman 3/8-Drive Vanadium Sockets. 06/28/06: Added a 1090-D Tappet Wrench. 06/08/06: Added a 3/8-Drive Craftsman Vanadium Breaker Bar. 06/06/06: More work on the early catalog information. 05/29/06: Started adding notes from early Sears catalogs. 05/12/06: Added a 1/2-Drive C-97 Ratchet. 04/30/06: Added a 9/32-Drive C-Series Socket Set. 04/08/06: Added C-F Battery Pliers. 03/16/06: Added 1/2-Drive C-Series Sockets. This is the first of several articles covering Craftsman brand tools. This installment will focus on the development of the Craftsman brand during the 1920s and 1930s, as well as covering some of the tools sold by Sears in the pre-Craftsman era, in order to provide background context. Later articles will cover the Craftsman "BE" and H-Circle Socket Tools from the 1930s and 1940s, and then the Craftsman Modern Era that began around 1945. Sears Roebuck was founded in 1886 by Richard W. Sears and initially operated as the R.W. Sears Watch Company in Minneapolis. From its modest beginning as a merchandiser of watches, the company grew to become the largest mail-order company in the United States, and eventually became the largest retail company. As a large and unique organization, Sears has been the subject of many publications and studies. The current owner of Sears maintains a website at www.searsarchives.com [External Link] with extensive historical and background information on the company, and the interested reader may want to review their page on Sears History [External Link]. For those readers primarily interested in tools, unfortunately most of the known references on Sears history have relatively little (or nothing) to say about tools, Craftsman or otherwise. If any of our readers have found a good reference covering tools at Sears, please let us know and we'll add the reference. The story of the Sears Craftsman brand begins in 1927 with the registration of the Craftsman trademark. A brief summary of the brand can be found on the Sears Archive site in the section on Craftsman History [External Link]. One well-known but undocumented aspect of Craftsman tools is the presence of a manufacturer's code marking on most (although not all) tools. These codes have served as a source of heated debate and endless speculation, as people interested in Craftsman tool history attempt to determine which company made a particular tool. In this section we'll present some reasoned arguments about why such manufacturer's codes came to exist, and then draw some general conclusions about the codes. Our explanation for the codes is very simple to state: the manufacturer's codes existed so that Sears could sort tools returned under warranty and send them back to the original maker for a merchandise credit. Under this explanation the manufacturer's codes can be seen as a natural consequence of the lifetime warranty offered for Craftsman tools, plus the observation that as the Craftsman product line expanded, an increasing number of contract manufacturers were needed to produce the tools. In observing the usage of manufacturer's codes, we've noted that most examples of the earliest Craftsman tools are not marked with a code. These examples would include the early "Chrome-Vanadium" open-end wrenches, "Vanadium Steel" open-end and tappet wrenches, and early pliers with checkered handle patterns. This raises the question as to when the manufacturer's codes first came into general use. One of the first groups of tools with a manufacturer's code could have been the open-end wrenches with "CI" or "AF" codes. This style of wrench appears to have been offered as early as 1933, based on catalog illustrations, although some examples of this style have been found without manufacturer's codes. Another early group of tools with a code would be the "BE" series of socket tools, which were offered by the fall of 1935. Once again though there are a few examples of "BE"-style tools that are not marked with a code and which might represent early production. Based on these considerations, it appears likely that the manufacturer's codes were first used sometime between 1934 and 1936, although not necessarily at the same time for different classes of tools. We will make use of this estimated beginning point in attempting to refine the manufacturing date estimates for some tools. Another observation is that some types of tools were never marked with a manufacturer's code, even if they were produced long after the codes were in general use. A prime example of this is the Craftsman 8-In-1 Socket Wrench, a well-known tool sold from the mid 1950s through 1960s, and produced only by J.H. Williams. To help understand how the manufacturer's codes might have arisen, imagine that you are the manager of a tool company in the 1930s, and that your company has recently signed a contract with Sears to produce tools for their new Craftsman brand. You've sent several shipments of tools to Sears, custom marked with the Craftsman brand as required by the contract, and your company has started to receive payments from Sears. In checking the most recent payment though, you notice that an amount has been deducted with the explanation "Returned Goods", and a few days later a package arrives from Sears with some broken and damaged tools. So you hand the package to your Quality Control department and ask them to analyze the problems. A few days later the head of QC reports back that they have examined the failures and have recommended some production changes, which hopefully will reduce the likelihood of future problems. Then he mentions, "Oh, by the way, we found a few tools in the shipment that weren't made here ... take a look at these." He hands you some tools that look at least similar to the ones you make, but with a few details that seem out of place. With the pile of stray tools on your desk, you call your contact at Sears and explain that some other company's tools have been included in the return shipment. The Sears representative then asks, "How do you know that those tools weren't made by your company?" At this point the conversation could take two different paths. If your company's tools already have some type of very specific marking, you explain to the Sears person that your tools always have a "WF" (or whatever) forged into the shank, and that Sears should use that marking for identification. The Sears representative then records your particular code on the chart used by the tool sorters, and agrees to true up your account in the next invoice. But what if your company's tools are very similar to the other production and have no special identifying marks? If you have to explain to Sears that your wrenches are a bit longer than the others, or that the shank is slightly convex instead of flat, Sears would probably respond that these differences are too subtle for the sorting personnel, and that you will need to add some kind of marking to the tools. Perhaps Sears even asks if you have a particular marking you'd like to use, or if you want them to assign a unique code. In either case, by the end of the conversation you have agreed with Sears on a manufacturer's code to be used for your company's tools, and this will presumably resolve the problem with incorrect returns. Although the hypothetical scenario above may not capture all of the details of the manufacturer's code system, it's plausible that at least some parts of this dialogue could have occurred, and probably on multiple occasions. As the sales of Craftsman tools increased, even a small one percent failure rate would have resulted in thousands of returns. If some of these returns were then sent to the wrong manufacturer, that almost certainly would have resulted in complaints and arguments. It would have been in the best interest of both Sears and their contract suppliers to make the return process operate smoothly and with minimal exceptional cases requiring further discussion or negotiation. In the remainder of this section we'll go though some typical questions related to manufacturer's codes, then offer a plausible answer based on the framework outlined above. If any readers have additional questions in this area, don't hesitate to ask via email. Q. Why are the early examples of some tools not marked with a manufacturer's code? A. When a new type of tool was introduced, initially there was probably only a single manufacturer, and the tools probably didn't closely resemble any of the existing tool models. Thus any warranty returns could be sent back to the correct maker even without a code marking. Q. Why do some manufacturer's codes appear to be mnemonics for the maker's name? A. In some cases a manufacturer may have already marked their production with a suitable identification code, so that it was not necessary for Sears to assign a code. Since companies (and individuals as well) often chose initials or abbreviations related to their names as identification, one would expect some codes to have a mnemonic association. Q. Why has Sears never published a list of its manufacturer's codes for hand tools? A. As a large retailer Sears was able to negotiate purchase agreements on very favorable terms, thereby allowing them to offer items at prices lower than what some smaller retailers could afford. Since many of the suppliers to Sears also sold products under their own brand names, these companies would have been concerned about undercutting their other sales channels, if it became widely known that the same items could be purchased less expensively through Sears. Thus, it would be reasonable to expect that at least some supplier contracts would require that Sears not publicly disclose the manufacturer of the products. Note that the above argument doesn't apply to products such as home appliances, for which spare parts and service are expected over the the lifetime of the item. Even if the maker of a washing machine wasn't disclosed, it would be obvious to an appliance repair person when the unit was opened for service. Thus in the case of electrical tools and appliances, Sears DOES disclose the list of manufacturer's codes, which is typically a three digit numeric code. Q. Could one manufacturer use multiple manufacturer's codes? A. Using multiple codes should not have been be a problem as long as the maker let Sears know in advance. There actually are some examples of this -- New Britain Machine used both a "BE" code and an H-Circle code for its production of sockets and drive tools. The "BE" code was used first and may have been assigned by Sears, but the H-Circle code was almost certainly intended to indicate production at a particular factory, the old Husky facility in Kenosha. This example points out an implicit use of the manufacturer's codes. Since the codes are associated with failed product returns, a company may wish to use the codes as part of its quality control system, in particular to identify a production facility. In this section we plan to include discussions of how certain manufacturer's codes were successfully attributed to a particular maker. We recently (November 2015) found a missing link to identify Billings & Spencer as the maker of the "AF" manufacturer code, in the form of a Patented Wrench Holder. In this section we want to provide additional evidence that Billings is the maker in question, as well as extend the identification to cover the "CI" tools. Furthermore, after reviewing the catalog evidence and comparing Craftsman and Billings tools, we will also show that Billings was the maker of the earliest Craftsman "Chrome-Vanadium" open-end and tappet wrenches, as well as the transitional "Craftsman Vanadium Steel" open-end wrenches that preceded the "AF" and "CI" models. Close Similarity of Craftsman "AF" and "CI" Examples. The pages here provide numerous examples of open-end wrenches, box-end wrenches, and combination wrenches with the same tool model in "AF" and "CI" variants. In all cases the production characteristics are nearly identical, and the slight differences in markings are what might be expected if the tools were being manufactured at two different locations. Same Wrench Holder for Merit "AF" Set Used Earlier for Craftsman Wrenches. The Sears 1933-1934 Fall-Winter catalog has an illustration on page 793 of Craftsman open-end wrenches in a wrench holder with concave edges, the same distinctive design as the patented holder with the Merit "AF" set linked above. The wrenches in the illustration have depressed panels with "Craftsman Vanadium" in the underline logo, matching the design of the Craftsman "CI" and "AF" wrenches. This establishes that Billings was providing Craftsman wrenches consistent with the "CI"/"AF" design in the 1933-1934 time frame. Craftsman Offset Box Wrenches Show Certain Billings Production Characteristics. Craftsman "CI" offset box wrenches have a construction style in which the shank meets the box end at the top of the box, giving it a "flat-top" appearance. This same construction style is seen in the Billings Vitalloy offset box wrenches. 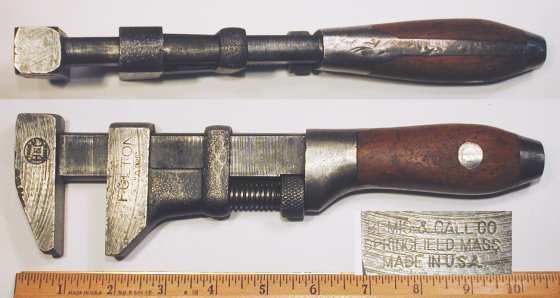 Although not unique in the industry, many other toolmakers produced offset box wrenches with the shank joining the box end near the center. The above points establish a strong case for recognizing Billings as the maker of the "AF" and "CI" variants of Craftsman wrenches. We will now offer additional evidence to show that Billings was also the maker of the earliest Craftsman wrenches with "Chrome-Vanadium" forged-in markings, as well as the subsequent "Craftsman Vanadium Steel" wrenches. Unique Design of Billings Early 300x Tappet Wrenches Matches Earliest Craftsman Tappet Wrenches. In the late 1920s Billings & Spencer offered a 300x series of tappet wrenches with a unique design having equal 22.5 degree offsets. The first Craftsman tappet wrenches matched the unusual design of the Billings wrenches and had the same model numbers (with a "C" prefix) as the Billings version. An example of the Craftsman version can be seen as the Craftsman C-3006 Tappet Wrench, with the corresponding Billings tool as the Billings 3006 Tappet Wrench. The matching design and markings provide positive identification of Billings as the maker of the first Craftsman tappet wrenches. These earliest Craftsman tappet wrenches were marked with "Craftsman" and "Chrome-Vanadium" forged into the shank, the same markings found on the earliest Craftsman open-end wrenches. Although the open-end wrenches do not have any unique design characteristics, the matching forged-in markings, the matching "C" prefix to the model numbers, and the fact that both open-end and tappet wrenches were offered at the same time all provide strong evidence for Billings as the maker of the open-end wrenches as well. Billings Early C-Series Wrenches Are Very Similar to "Craftsman Vanadium Steel" Wrenches. Our article on Billings & Spencer has a section on early alloy C-Series Open-End Wrenches, the name for which is based on the "C" model number prefix. These Billings wrenches are very similar to the "Craftsman Vanadium Steel" Wrenches shown in this article. For the cases in which we have both a Craftsman and Billings example, the wrenches are nearly identical in shape, dimensions, and even model number markings, with small differences that one might expect based on production in different factories or at different times. Matching Wrench Holder Illustrations for Billings Wrenches and "Craftsman Vanadium Steel" Wrenches. The Sears 1931 Spring-Summer catalog lists a set of six Billings open-end wrenches on page 866, with an illustration showing the set in a wrench holder with a distinctive wire loop closure. The same page offers "Craftsman Vanadium Steel" open-end wrenches in a holder with the same wire loop closure, providing good evidence that Billings was also the supplier for the Craftsman wrenches. In summary, the above points provide conclusive evidence that Billings was the maker of Craftsman wrenches, beginning with the earliest "Chrome-Vanadium" open-end and tappet wrenches in 1930 and extending through the later "AF" and "CI" open-end, tappet, and box-end wrenches. After the brief discussion of manufacturer's codes in the previous section, in this section we'll provide a table of the various codes that appear on tools in the articles here. One of the goals of the Craftsman articles is to identify the manufacturers responsible for the various lines of Craftsman tools, and for the associated brands such as Dunlap as well. Unfortunately it has proven to be fairly difficult to determine the manufacturer associated with some of the codes, and as a result there are still a number of "Unknown" entries in the table. Currently the table is incomplete, but more codes will be added as new examples are found. In addition, entries will be added to the table for manufacturers identified by specific production or stylistic characteristics, even if no codes were marked on the tools. This table includes the codes for manufacturers active during the early Craftsman years from the 1920s to the mid 1940s. Additional codes applicable to later years can be seen in the section on Manufacturing Codes, Mid 1940s to 1970s. A.0. Block letters J.P. Danielson 1934-1939 Observed on earlier Craftsman Vanadium adjustable wrenches. Also noted on Dunlap Pliers. AF Block Letters Billings 1930s to 1940s Generally stamped, rarely forged-in. Found on open-end, box-end, and combination wrenches. Identified by patented clip on Merit 6-Piece Wrench Set. AM Block Letters Unknown 1930s to 1940s Typically preceded or followed by digits, e.g. 41AM or AM42. Found on Craftsman pliers, e.g. Craftsman Angle-Nose Pliers. AZ-Circle "AZ" in a Circle J.H. Williams 1950s to 1960s Found on Craftsman Locking Adjustable Wrench. BC Block Letters Unknown 1930s to 1940s Found on Craftsman Vanadium Cotter Pin Puller. BM Block Letters S-K Tools 1930s to 1940s Known only on 3/4-Drive tools. BT Block letters Vlchek 1930s to 1940s Identified by Craftsman "BT" Ratchet. Also known on other Craftsman, Dunlap, and Merit tools. C-Circle "C" in a Circle Unknown 1930s to 1940s May be stamped or forged. Found on Craftsman pliers, e.g. Craftsman Electrician's Pliers. C-F Block Letters Probably Herbrand 1930s Stamped mark. Related to Herbrand "CFT" mark? Found on Craftsman "C-F" Battery Pliers. CI Block Letters Billings 1920s to 1940s Typically forged into open-end wrenches. Forged-in or stamped on box-end and combination wrenches. Also noted on Fulton wrenches, possibly from 1920s. Less common on Dunlap wrenches. F-Circle "F" in a Circle Millers Falls 1930s to 1940s? Found on Craftsman Four-Way Screwdriver. H-Circle "H" in a Circle New Britain Machine 1933 to 1940s Used on sockets and drive tools similar to "BE" series. K-Circle "K" in a Circle S-K Tools 1930s to 1940s Generally found on 3/4-drive tools. LC Block Letters J.P. Danielson 1930s to 1960s Stamped code observed on pliers, e.g. Dunlap Combo Pliers. Usage appears to overlap with "A.0." code. N-Square "N" in a Square Unknown 1930s to 1940s? Found on chisels and punches, e.g. Dunlap Center Punch. Also noted on Craftsman 4-Position Waterpump Pliers. P-Circle "P" in a Circle Wilde Tool 1940s to 1960s Stamped or forged. Often found on pliers with rope-banded gripping pattern. V Block Letters Moore Drop Forging 1938 Onward Generally stamped, but may be forged on early tools. Early usage noted on tappet wrenches and Dunlap wrenches. 312.1 Block Numbers J.P. Danielson Early 1940s Observed on later Craftsman Vanadium adjustable wrenches. Also noted on Fulton Pliers. X30 Short Offset Box Wrench. e.g. Craftsman Vanadium "Midget" Socket Set. e.g. Craftsman Vanadium 1729 Wrench. N/A Text on Curved Arc Duro/Indestro Late 1930s Observed on Craftsman No. 3 Tappet Wrench. Appendix A provides extensive reviews of the tool listings in the Sears catalogs from the late 1920s to early 1940s. Since the detailed reviews are sometimes hard to follow for a specific tool type, we have summarized the listings in the table below. The table is not yet complete, but will be expanded to show the introductory dates of Craftsman tools in the major types covered by our articles here. Open-End Wrenches Forged-in Markings 1930 (Spr) 1931 Craftsman and "Chrome-Vanadium" forged into shank. Craftsman Vanadium Steel 1931 1933 Craftsman block logo. "Craftsman Vanadium Steel" stamped on shank. "Craftsman Vanadium Steel" C-1731 Open-End Wrench. Craftsman Vanadium 1933 (Fall) Craftsman underline logo. "Craftsman Vanadium" forged into depressed panel. Tappet Wrenches Long Format 1935 (Spr) Tappet wrenches in 10 inch length. Adjustable Wrenches Broached Hole 1934 (Fall) Adjustable wrenches with broached hanging holes. Pliers Angle-Nose Gripping 1931 (Spr) Slip-joint pliers with angled nose. Size 8 inches only. Button's Pattern 1930 (Fall) 1937 Pliers with three Button's cutting slots. Sizes 6, 8, and 10 inches. Button's Pattern 8.5in 1938? 1942 Pliers with three Button's cutting slots in 8.5 inch size. Combination 1930 (Fall) 1935 (Fall) Slip-joint combination pliers with side-cutters. Sizes 5.5 and 7 inches. Craftsman 5797-5.5 Slip-Joint Combination Pliers. Diagonal Cutters, 5 Inch 1930 (Fall) 1938 Diagonal cutting pliers in size 5 inches. Diagonal Cutters, 6 Inch 1930 (Fall) Diagonal cutting pliers in size 6 inches. Diagonal Cutters, 7 Inch 1935 Diagonal cutting pliers in size 7 inches. Electrician's, 6 Inch 1930 (Fall) 1938 Lighter duty lineman's pliers in size 6 (or 6.5) inches. Electrician's, 7 Inch 1930 (Fall) 1942 Lighter duty lineman's pliers in size 7 inches. Electrician's, 8 Inch 1930 (Fall) 1938 Lighter duty lineman's pliers in size 8 (or 8.5) inches. Lineman's, 6 Inch 1930 (Fall) 1935 (Fall) Heavy-duty (Klein Pattern) lineman's pliers. Size 6 (or 6.5) inches. Later discontinued. Lineman's 1930 (Fall) Heavy-duty (Klein Pattern) lineman's pliers. Sizes 7 and 8.5 inches. Long Nose, 6 Inch 1930 (Fall) Long nose (needlenose) pliers with side cutters. Long Nose, 7 Inch 1930 (Fall) 1938 Long nose (needlenose) pliers with side cutters. Size 7 inches. Later discontinued. Box-End Wrenches Short Offset 1933 (Spr) Offset heads in short length. Three models available. Standard Angled 1933 (Spr) Angled heads in standard length. Six models available. Standard Offset 1933 (Fall) Offset heads in standard length. Six models available. Short Angled 1934 (Fall) 1938 (Fall) Angled heads in short length. Three models available. Raised panels with "Craftsman Vanadium" markings. Raised Panels 1934 Raised panels with "Craftsman Vanadium" markings. Socket Sets "C-Series" Sets 1932 (Fall) 1936 Available in 1/2-drive and 9/32-drive. "C-Series" "Fit-Mor" 1933 (Fall) 1936 C-Series set in 3/8-drive. "C-Series" "Midget" 1933 (Fall) 1935 Craftsman C-Series "Midget" 9/32-Drive Set. "BE" Series 1935 (Fall) 1947 Craftsman "BE" sets available in 1/4, 3/8, and 1/2 drive sizes. "BE" Midget Set 1935 1947 Craftsman "BE" "Midget" 1/4-Drive Set. In metal clip with thumbscrews. "BE" Reversible Ratchets 1938 1947 Reversible ratchets in 1/2-drive first illustrated. "BE" Super Socket Set 1938 1942 Large set with amber plastic handles on drive tools. Product information was obtained from a number of Sears Roebuck general catalogs in the earlier years, and from Craftsman tool catalogs for the years after 1938. Detailed notes on the catalog listings can be found in the section on Catalog Reviews. 1929 Fall & Winter No. 159 General catalog. 1930 Spring & Summer No. 160 General catalog. First listing of Craftsman open-end wrenches. 1930 Fall & Winter No. 161 General catalog. First listing of Craftsman pliers and adjustable wrenches. 1931 Spring & Summer No. 162 General catalog. 1931 Fall & Winter No. 163 General catalog. 1932 Spring & Summer No. 164 General catalog. 1932 Fall & Winter No. 165 General catalog. First listing of Craftsman C-Series socket sets. 1933 Spring & Summer No. 166 General catalog. First listing of Craftsman box-end wrenches. 1933 Fall & Winter No. 167 General catalog. Lists Cross Country tools. 1934 Spring & Summer No. 168 General catalog. 1934 Fall & Winter No. 169 General catalog. 1935 Spring & Summer No. 170 General catalog. 1935 Fall & Winter No. 171 General catalog. First listing of Craftsman "BE" socket sets. 1936 Spring & Summer No. 172 General catalog. 1937 Spring & Summer No. 174 General catalog. 1938 Fall & Winter No. 177 General catalog. Craftsman "BE" 1/2-drive reversible ratchets available. 1938? Craftsman Tools N/A First catalog of Craftsman hand tools. 1939 Fall & Winter No. 179 General catalog. Pliers with "Nested Diamond" gripping pattern. 1941 Spring & Summer No. 182 General catalog. "Craftsman Vanadium" still illustrated. 1942 Craftsman Mechanics Tools N/A Notes use of "special alloy steel" where previous catalogs noted "chrome vanadium". Sears had been selling tools and hardware for several decades prior to the introduction of the Craftsman brand in 1927. This section will show examples of the kinds of tools offered in this early period, using a mix of catalog illustrations and actual photographs when the tools are available. Fulton and the "Fulton Tool Company"
Fulton was a familiar brand of tools in the early 20th century by virtue of numerous listings for Fulton tools in the Sears Roebuck catalogs. In the pre-Craftsman days, Fulton appeared to be the most popular brand offered by the Sears for tools such as saws, axes, planes, chisels, hammers, pliers, and many other items. References to Fulton tools appear in Sears catalogs at least as early as 1908, with illustrations showing either "Fulton" or "Fulton Tool Co." on the tools. Based on the wide variety of Fulton products offered, many of Sears' customers probably assumed that the Fulton Tool Company must be a major manufacturer, and that was our starting assumption as well. However, after an extensive and fruitless search for a Fulton business entity that could account for such a range of products, we eventually concluded that Fulton was not an independent manufacturer after all, but rather an unregistered internal brand used by Sears as a conduit for private branding. Since some of our readers may be surprised by this conclusion, we'll outline the evidence gathered to date. The most important factor is the lack of advertising or product coverage for Fulton apart from the Sears catalogs. An independent company would normally not want to rely too heavily on one retailer, so given the wide range of products offered, there should be numerous advertisements and announcements for Fulton products in magazines and trade publications. Many such publications are now searchable online as part of the "Google Books" effort, but an extensive search turned up no apparent "Fulton Tool" entity that could account for the known range of products. In fact, the only catalog (other than Sears) known to list Fulton tools is a publication from the United Hardware and Tool Manufacturing Company, which shows an extensive selection of Fulton tools such as wood planes. When we first found this catalog, we attributed Fulton as the "house brand" for United Hardware, but more recent information has identified United Hardware as a manufacturer's agent for the export market. In light of this new information, the listings for Fulton tools in the United Hardware catalog can be interpreted as an effort by Sears to develop export markets for its tool items. Other evidence is summarized in the list below and will be expanded upon when time permits. Too Much Variety for One Company. Specific Makers Identified for Some Fulton Tools. Fulton Mentioned as a Sears Brand in Company History. In the figures below we'll show some examples of Fulton tools of probable pre-Craftsman origin, and where possible will identify the manufacturer. Examples of the continuing use of the Fulton brand in the post-Craftsman era can be found in a section on Later Fulton Tools. Fig. 1A. Fulton 100 3/8x7/16 S-Shaped Open-End Wrench, ca. Early 1900s to 1920s. Fig. 1A shows an early Fulton 100 3/8x7/16 S-shaped open-end wrench, stamped with "Fulton Tool Co." on the shank, and with a forged-in model number "100" at the left. Fig. 1B. Fulton 102 5/8x11/16 S-Shaped Open-End Wrench, ca. Early 1900s to 1920s. Fig. 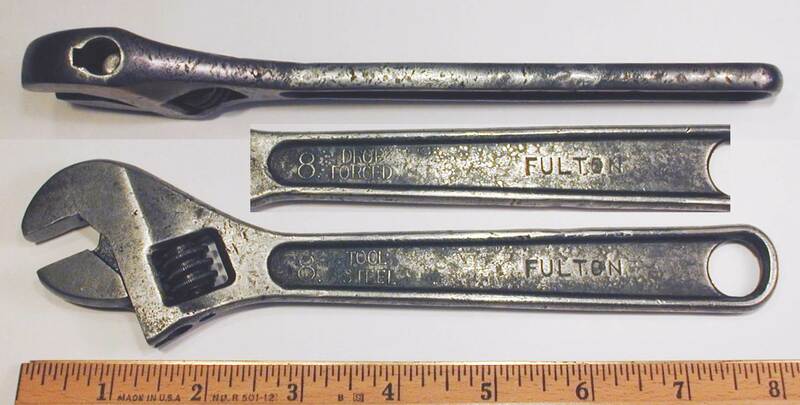 1B shows an early Fulton 102 5/8x11/16 S-shaped open-end wrench, stamped with "Fulton Tool Co." on the shank, and with a forged-in model number "102" at the left. Currently many of the known examples of Fulton open-end wrenches are marked with an "CI" code, a code also found on many Craftsman wrenches. This strongly suggests that the maker of the Fulton open-end wrenches also produced Craftsman-branded tools. 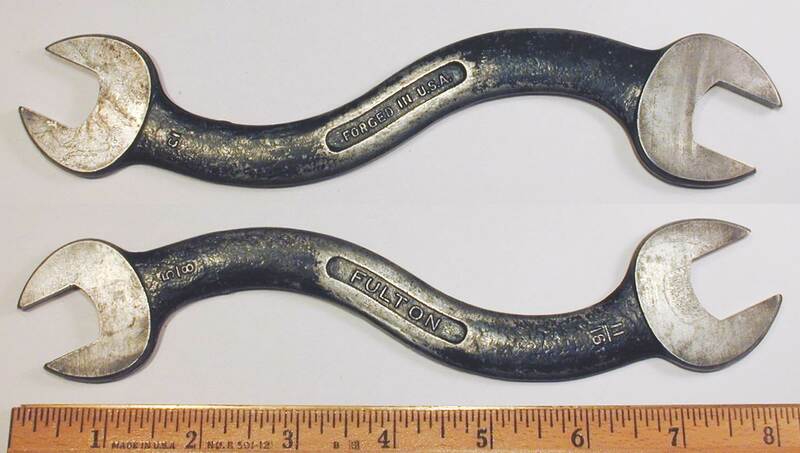 The next several figures show examples of Fulton open-end or "S" wrenches with the "CI" code. Fig. 2. Fulton "CI" 19/32x11/16 Open-End Wrench, with Insets for Side View and Reverse Detail. Fig. 2 shows a Fulton 19/32x11/16 open-end wrench, marked with "Fulton" forged into the shank, with "Forged in U.S.A." and a "CI" code on the reverse. The overall length is 6.4 inches, and the finish is cadmium plating. Fig. 3. Fulton "CI" 5/8x3/4 Open-End Wrench, with Inset for Reverse Detail. Fig. 3 shows a Fulton 5/8x3/4 open-end wrench, with the Fulton name forged into a small depressed panel, and with "Forged in U.S.A." on the reverse. The inset shows a forged-in "CI" code on the reverse side, a mark frequently seen on both Fulton and Craftsman tools. An example of the "CI" mark on a Craftsman tool can be seen on the Craftsman Vanadium 1033C Wrench. Fig. 4. Fulton "CI" 25/32x7/8 Open-End Wrench, with Inset for Reverse. Fig. 4 shows a Fulton 25/32x7/8 open-end wrench, marked with "Fulton" forged into the shank, with "Forged in U.S.A." and a "CI" code on the reverse. The overall length is 8.3 inches. Fig. 5. Fulton 3/8x7/16 S-Shaped Wrench, with Inset for Reverse, ca. 1920s to 1930s. Fig. 5 shows a Fulton 3/8x7/16 S-shaped wrench, marked with the Fulton name forged into a depressed panel on the shank, with "Forged in U.S.A." forged into the reverse panel. The shank is also marked with the fractional sizes forged into the front, with a "CI" manufacturer's code forged into the reverse. The overall length is 8.1 inches, and the finish is black paint. Fig. 6. Fulton 5/8x11/16 S-Shaped Wrench, with Inset for Reverse, ca. 1920s to 1930s. Fig. 6 shows a Fulton 5/8x11/16 S-shaped wrench, marked with the Fulton name forged into a depressed panel on the shank, with "Forged in U.S.A." forged into the reverse panel. The shank is also marked with the fractional sizes forged into the front, with a "CI" manufacturer's code forged into the reverse. Fig. 7. Fulton 3/4x13/16 S-Shaped Wrench, with Inset for Reverse, ca. 1920s to 1930s. Fig. 7 shows a Fulton 3/4x13/16 S-shaped wrench, marked with the Fulton name forged into a depressed panel on the shank, with "Forged in U.S.A." forged into the reverse panel. The shank is also marked with the fractional sizes forged into the front, with a "CI" manufacturer's code forged into the reverse. The overall length is 9.1 inches, and the finish is black paint. Fig. 8. Fulton 25/32x7/8 S-Shaped Wrench, with Insets for Reverse Detail. Fig. 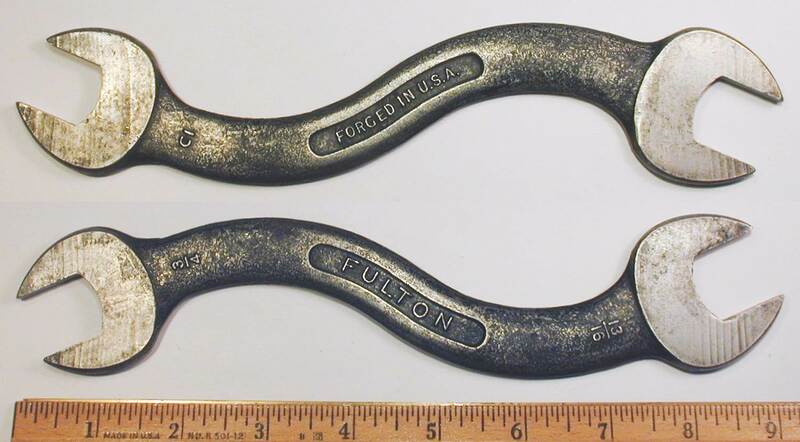 8 shows a Fulton 25/32x7/8 S-shaped wrench, marked with the Fulton name forged into a small depressed panel, with "Forged in U.S.A." and a "CI" manufacturer's code forged into the reverse. The overall length is 10.0 inches, and the finish is black paint. Fig. 9. Fulton "Tool Steel" 8 Inch Adjustable Wrench, with Insets for Side View and Reverse Detail, ca. Mid to Late 1920s. Fig. 9 shows a Fulton 8 inch adjustable wrench, stamped with "Fulton" on both sides of the shank. The shank is also marked with "8" and "Tool Steel" forged into the front, with "8" and "Drop Forged" forged into the reverse. The overall length is 8.1 inches, and the maximum opening is 1.0 inches. The head thickness was measured at 0.61 inches. The markings and construction of this wrench suggest that the maker is likely the Diamond Calk Horseshoe Company. Diamond was active as a contract maker of adjustable wrenches from the 1920s onward, and their production of this era was marked with "Tool Steel" and "Drop Forged". An example of a similar wrench can be seen as the Diamond 8 Inch Adjustable Wrench. Fig. 10. Fulton "AD" 10 Inch Monkey Wrench, with Insets for Side View and Reverse Detail, ca. 1920s to 1930s. Fig. 10 shows a Fulton 10 inch monkey wrench with wooden handle inserts, stamped with "Fulton" and "AD" on the lower jaw. The upper (fixed) jaw is stamped with the B&C trademark logo on the front, with "Bemis & Call Co." and "Springfield, Mass. Made in U.S.A." on the reverse. The overall length is 10.3 inches, and the maximum opening approximately 2 inches. The finish is plain steel. The markings on this wrench clearly identify Bemis & Call (B&C) as the manufacturer for the Sears Fulton brand. Bemis & Call was a well-known maker of adjustable wrenches, with operations extending back to the mid 19th century. Additional information on the company can be found in our article on Bemis & Call Company. The meaning of the "AD" marking is not known. Sears was probably supplying socket sets for automotive service by 1912 or even earlier. By this time the automobile market was growing rapidly and the socket sets produced by Bay State, Mossberg, and others were regarded as effective (even essential) tools for automotive maintenance. 1913 Listing for Sears Aristocrat No. 1 "Auto Kit" Socket Set. The scan at the left shows our earliest Sears catalog reference for socket sets, a listing for an "Aristocrat No. 1 Auto Kit" from a 1913 "Automobile Supplies" catalog. This set is easily identifiable as a Bay State No. 1 Autokit by the distinctive ratchet design. 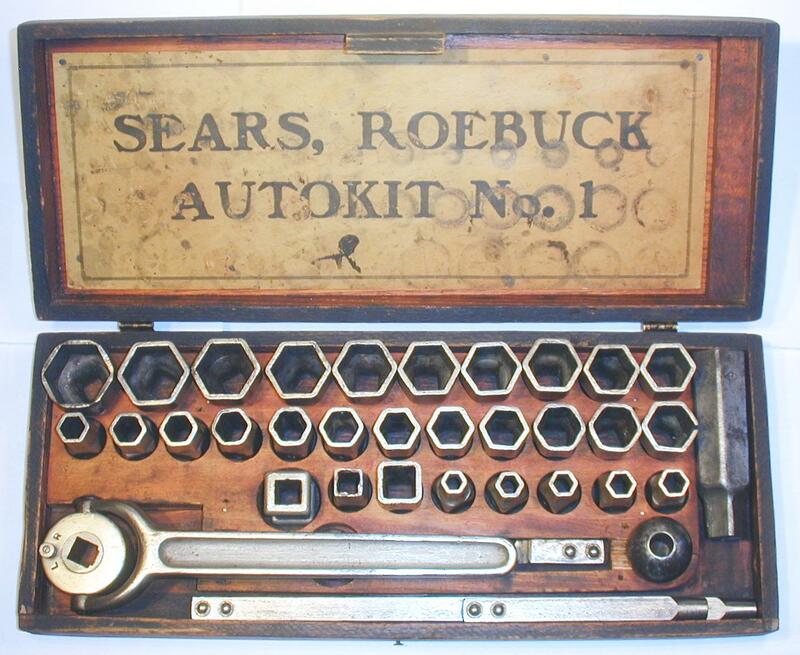 We are fortunate to have examples of both a Sears branded Sears Roebuck Autokit No. 1 and of an original Bay State No. 1 Autokit for your viewing pleasure. Within a few years the Frank Mossberg Company had become the prime supplier of socket sets for Sears, as a 1917 Justice Tires catalog lists several sets recognizable as Mossberg production, as well as ratchets, tools, and individual sockets. ("Justice" was a Sears trademark for automobile tires before they adopted the "Allstate" brand.) We also have Justice Tires catalogs from 1918, 1919, 1922, and 1924. The 1917 catalog has a listing and illustration for the "Aristocrat No. 1 Socket Wrench Set", which includes a No. 350 ratchet, extension, universal, 27 hex sockets, and three square sockets. This set appears to match the specifications of the Mossberg Auto-Clé No. 1 set, but with the Auto-Clé cylindrical ratchet replaced by the standard No. 350 model. A second smaller set called the "Aristocrat Junior Socket Wrench Set" is easily identifiable as a Mossberg No. 6 Socket Set by means of the distinctive folding Tee handle. A somewhat later Justice Tire catalog from 1922 lists several socket sets identifiable as Mossberg production, plus a set that appears to be a Packer Auto Specialty "Ray" socket set. The 1922 illustration for the "Aristocrat No. 1 Socket Wrench Set" has been updated with a different forged-body ratchet, but the description has the same specifications as before, matching the contents of the Auto-Clé No. 1 except for a different ratchet. The sockets in the illustration are clearly marked with the Mossberg M-Diamond logo. A second set is called the "Universal Socket Wrench Set", and the illustration shows a large wooden box holding the sockets and drive tools, with a lift-out tray to hold open-end wrenches, pliers and other tools. The distinctive appearance clearly identifies this as the Mossberg No. 14 socket set, the largest and most complete set of sockets and tools offered by Mossberg. In addition to the familiar pressed-steel socket sets, the early Sears catalogs also offered other types of socket tools, such as the socket sets of malleable iron made by the Chicago Manufacturing and Distributing Company. With the thousands of artifacts at Alloy Artifacts it's always difficult to pick a favorite, but this next set would certainly be high on the list. It offers both an interesting and innovative design with historical importance as our earliest documented example of a socket set sold by Sears Roebuck. Fig. 12. Sears Roebuck Autokit No. 1 Socket Set, ca. 1910-1914. Fig. 12 shows an early Sears Autokit No. 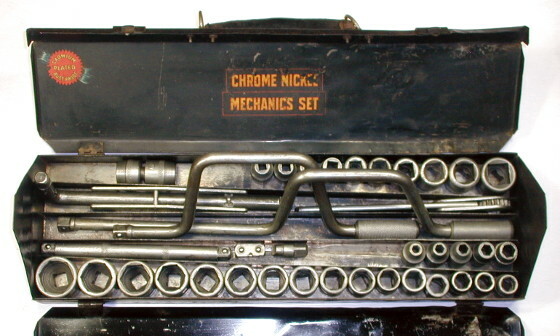 1 pressed-steel socket set in its wooden box, consisting of a rotating head ratchet, two extension bars, a screwdriver bit, a universal, a spherical end-piece, 27 hex sockets from 5/16 to 1-9/32, three square sockets (including a union), and a spark-plug (deep) socket. The set is labelled with a placard inside the top lid printed with the text "Sears, Roebuck Autokit No. 1" in block letters. The "Autokit" name and distinctive rotating head ratchet immediately identifies the set as a Bay State No. 1 Autokit, produced by the Tudor Manufacturing Company from early 1909 onwards. The 27 hex sockets include all sizes from 5/16 to 1 inch by 32nds, plus the four larger sizes 1-1/32, 1-3/32, 1-5/32, and 1-9/32. The sockets are arranged from smallest to largest beginning left to right with the fourth socket in the bottom row, continuing left to right in the middle row, then continuing right to left in the top row. The three square sockets at the left of the bottom row include a 1/2-drive union, followed by 13/32 and 21/32 pressed-steel sockets. The 29/32 spark-plug socket at the far right is a replacement for the missing original socket. Currently our earliest catalog reference for this set is from a 1913 Sears "Automobile Supplies" catalog, where an illustration and description of the set appears on page 99 under the heading "Aristocrat No. 1 Auto Kit". Fig. 13. Listing for Aristocrat No. 1 Socket Set, 1917. Fig. 13 shows a listing for the "Aristocrat No. 1" socket set published on page 39 of the 1917 Justice Tires catalog. This socket set can be identified as production by Mossberg by the illustration and contents. In later catalogs the illustration for this set shows the sockets spilled in front of the box, with the Mossberg M-Diamond logo visible on the sockets. The set is functionally identical to the Auto-Clé No. 1 Set, but differs by the substitution of a standard Mossberg No. 350 Ratchet for the tubular ratchet normally included in the Auto-Clé set. 1917 Catalog Listing for Aristocrat Jr. Socket Set. The scan at the left shows a listing for the smaller "Aristocrat Jr." socket set, also appearing on page 39 of the 1917 Justice Tires catalog. This set can be easily identified as a Mossberg No. 6 Socket Set by the distinctive folding Tee-handle. The set is functionally identical to the examples shown in our Mossberg article, but is illustrated in a fiberboard case instead of the wooden box or leather cases used for earlier sets. The catalog page with the Aristocrat socket sets also included other socket-related tools. Tools available separately included the Mossberg No. 330 Tee-handle, No. 350 ratchet, No. 355 ratchet, and individual hex and square sockets. These items were not identified as the Mossberg brand in the text, but the illustrations for the sockets clearly show the M-Diamond logo. 1917 Catalog Listing for Mossberg Pressed-Steel Sockets from Justice Tires Catalog. One of the more significant listings in the 1917 Justice Tires catalog is a table offering individual Mossberg hex and square pressed-steel sockets, as this next example shows. The scan at the left shows a table offering individual Mossberg hex and square pressed-steel sockets, printed on page 39 of the 1917 Justice Tires catalog. Note that each socket size and type is listed with its own catalog number, and that all sizes carry the same 15 cent price. Although the text doesn't mention the name Mossberg, the illustration clearly shows the Mossberg M-Diamond trademark on the sockets. This catalog listing goes a long way in explaining why old pressed-steel socket sets of any brand frequently include Mossberg replacement sockets. Sears continued to offer Mossberg socket sets at least into the mid 1920s. This next figure shows a 1922 listing for the Aristocrat No. 1 set. 1922 Catalog Listing for Aristocrat No. 1 Socket Set. The scan at the left shows a slightly later listing for the "Aristocrat No. 1" socket set, published on page 41 of the 1922 Justice Tires catalog. The illustration is a little different from the earlier example, as a number of the sockets are displayed lying in front of the box, and a careful look shows that several sockets are marked with the Mossberg M-Diamond logo. As with earlier listings, the catalog description notes the inclusion of 27 hex sockets, and the set as described is functionally identical to the Auto-Clé No. 1 Set. One notable difference though is that the illustration shows a forged-body ratchet in the set, instead of the pressed-steel ratchet shown in earlier Sears catalogs, or the tubular ratchet normally included in the Auto-Clé set. Some of our readers may recognize this as the infamous W.&M. Co. Mystery Ratchet. 1919 Listing for Chicago Manufacturing Socket Set. The scan at the left shows a listing for a "Socket Wrench Set" found on page 13 of the 1919 Justice Tires Sales catalog. The illustration shows a set of seven sockets in a box, with a ratchet handle, universal, and extension displayed in front. The distinctive design of the tools allows the maker to be identified as the Chicago Manufacturing and Distributing Company, and the illustrated set is very similar to the Chicago Manufacturing No. 60 Socket Set. Note in particular that the illustration shows the "A1" model number on the ratchet handle and the "A25" model on the extension. The socket sizes in the catalog listing differ somewhat from the sizes in the No. 60 set, but this may be confusion arising from differences in actual and nominal sizes. The Chicago Manufacturing and Distributing Company was notable for making sockets and drive tools of malleable iron, a less common construction method at a time when pressed-steel sockets were the dominant technology. The Sears catalogs offered socket sets by Chicago Manufacturing from 1919 (or earlier) until at least the mid 1920s. 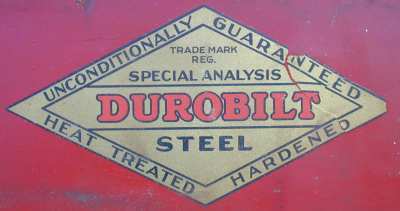 By the late 1920s Sears was offering socket sets under a number of brands, including Duro-Bilt, Hinsdale, Merit, and others. These sets were built around 1/2-drive tools and cold-broached machined sockets, the dominant technology in the 1920s and 1930s, and were very similar to the sets eventually offered under the Craftsman brand. We have several examples of pre-Craftsman socket sets, from Duro Metal Products, Hinsdale, and other makers, and are currently preparing them for display. Fig. 18. Duro Metal Products "Double Guarantee" 1/2-Drive Socket Set, ca. 1929-1931. Fig. 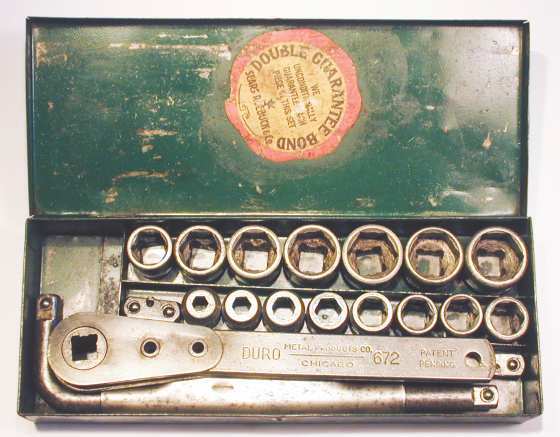 18 shows an early Duro Metal Products 1/2-drive socket set with a Sears Roebuck "Double Guarantee" paper label on the lid. The set consists of a No. 672 ratchet, a No. 660 L-T convertible handle, an extension, a drive plug, and 15 hex sockets ranging from 5/16 up to 1 inch. The No. 660 L-T handle also has a patent pending marking, in this case a reference to patent #1,744,413. The pending status for the ratchet and L-T handle places the manufacturing date for the set in the range 1929-1931. The socket sizes from the front left are 5/16, 3/8, 7/16, 1/2, 9/16, 19/32, 5/8, and 21/32, and from the back left are 11/16, 3/4, 13/16, 7/8, 15/16, 31/32, and 1 inch. 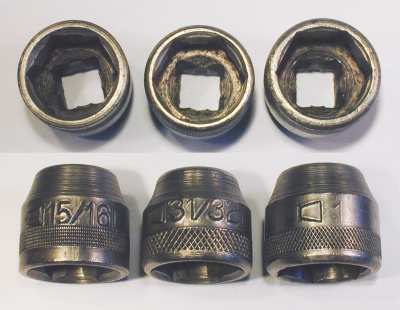 The sockets are all stamped with the fractional size, and most are marked with a stylized "D" referred to as the Duro D-Trapezoid logo, although the "D" marking has been omitted on at least one socket. The metal box has dimensions 10.9 inches wide by 4.3 inches deep by 1.6 inches high. This set is very similar to "Merit Tool Ratchet Wrench Set" listed in the 1929 Sears catalog. The Sears set includes the same drive tools with 14 hex sockets and a screwdriver socket, and the listing even mentions the green metal box. Assuming that this is the set described in the Sears catalog, the photograph includes one extra socket (possibly the 31/32) and is missing a screwdriver socket. The 1929 Sears price was just $1.98 postpaid. This set is also displayed as the Duro Metal Products "Double Guarantee" Socket Set in our article on Duro/Indestro, which has additional photographs of the tools and sockets in the set. Fig. 19. Duro Metal Products No. 660 1/2-Drive L-T Convertible Handle, with Inset for Marking Detail, ca. 1929-1931. Fig. 19 shows the Duro Metal Products No. 660 L-T convertible handle from the "Double Guarantee" set, configured as a Tee-handle for the photograph. 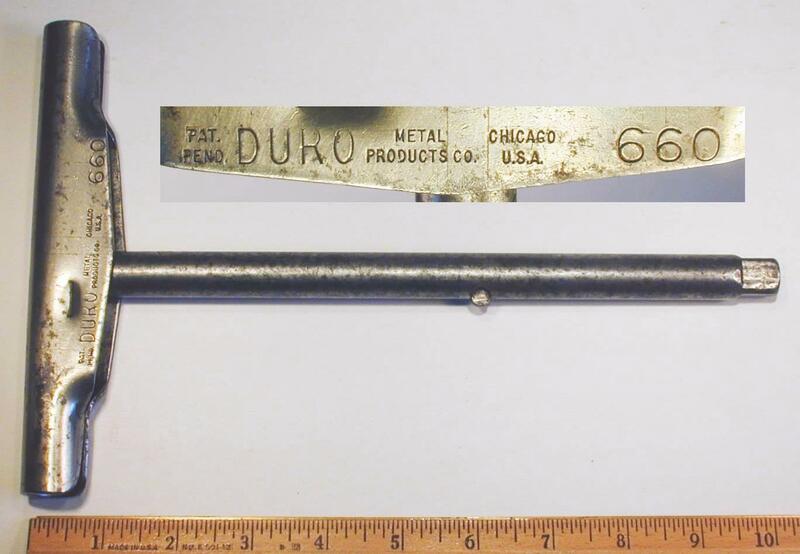 The sheath is stamped "Duro Metal Products Co." and "Chicago U.S.A.", with a "Pat. Pend." notation at the right. The overall length is 10.6 inches, and the finish is nickel plating. The pending status refers to patent #1,744,413, filed by E.H. Peterson et al in 1929 and issued in 1930. The L-T convertible handle consists of a 5/8-diameter Ell-shaped bar with 1/2 square drive studs on each end, together with a sheet metal sheath to form a hand grip. The sheath can be placed either over the short end of the bar to form a Tee-handle, as in the photograph here, or placed on the long end of the bar as a grip and extender. The sheath can be completely removed from the bar if not needed. Fig. 20. Duro Metal Products Large Sockets from "Double Guarantee" Socket Set, with Inset for Broaching, ca. 1929-1931. Fig. 20 shows the three largest sockets from the Duro Metal Products "Double Guarantee" 1/2-drive socket set, with sizes (from the left) 15/16, 31/32, and 1 inch. The sockets are stamped with the Duro D-Trapezoid logo on each side of the fractional size, except that the 1 inch socket has only one "D" logo. These larger sockets have a distinctive design with a reduced diameter at the 1/2-square drive end, a pattern mirroring the reduced diameter at the service end for the smaller sockets. The sockets have a band of cross-hatched knurling at the service end, with the knurling coarse enough to assist with turning a nut by hand. 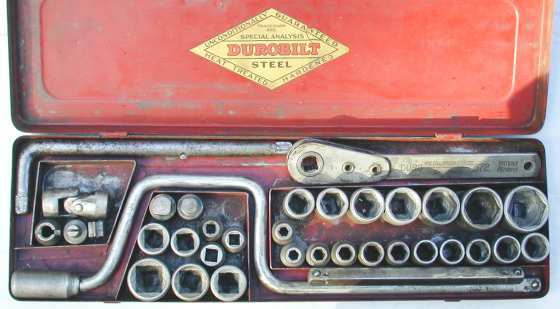 The 1930 and 1931 Sears catalogs offer a number of "DuroBilt" brand socket sets, and the tools in the illustrations closely resemble the sets from Duro Metal Products and Indestro Manufacturing. (See our article on Duro and Indestro for more information on these important companies.) Although these Duro-Bilt sets are now seldom found, we have acquired two examples of the sets and can confirm that Duro Metal Products was the manufacturer. Our first Duro-Bilt set is listed in the Sears catalog as the "36-Piece Wrench Set" and consists of drive tools and sockets in a hinged metal case. (The catalog listing is on page 483, for any readers with this Sears catalog.) A check of the contents with the catalog listing showed that our set is nearly complete, with only a few pieces missing. Fig. 21A. Duro-Bilt "36-Piece" 1/2-Drive Socket Set, ca. 1930-1931. Fig. 21A shows the Duro-Bilt 36-piece 1/2-drive socket set as acquired, but with two missing tools filled in from our general inventory. The set consists of a No. 672 ratchet, a drive plug, an Ell-handle, a speeder, an extension, a universal joint, 18 hex sockets, eight square sockets, and several miscellaneous attachments. The No. 672 ratchet is stamped "Duro Metal Products Co." and "Chicago" on the handle and has a "Patent Pending" notation, known to be a reference to patent #1,798,481. (This ratchet is a familiar tool and further information can be found in the section for the Duro 672 Ratchet.) The ratchet's patent status, together with the known catalog reference, places the manufacturing date for the set around 1930-1931. Fig. 21B. Duro-Bilt Decal from 1/2-Drive Duro-Bilt Socket Set. Fig. 21B at the left shows the Duro-Bilt decal on the inside lid of the socket set. The decal is printed with "DuroBilt" and "Special Analysis Steel" in the center of the diamond, with "Unconditionally Guaranteed" and "Heat Treated Hardened" along the borders. The decal matches the one shown in the Sears catalog, making the identification of the set quite certain. This set is also displayed as the Duro-Bilt 1/2-Drive Socket Set in our article on Duro/Indestro, which has further information on the tools and sockets in the set. This set was quite a significant find, as it is one of the earliest known examples of 1/2-drive socket tools sold by Sears Roebuck. The 1930-1931 origin of this set means that it predates the Craftsman C-Series Socket Sets by a year or two. 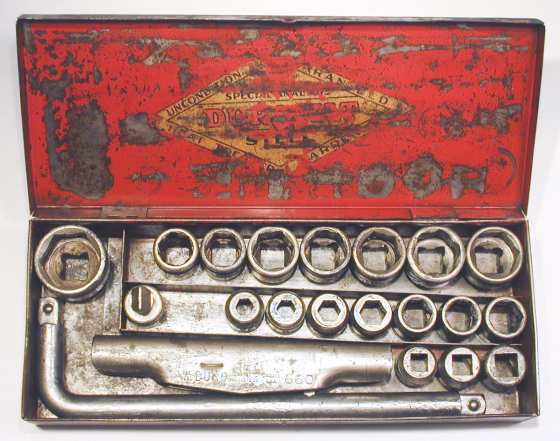 The 1930 and 1931 Sears catalogs offered a Duro-Bilt "20-Piece Socket Wrench Set" with a note that it was especially suited for Model "A" Ford owners. We were fortunate to acquire an example of this set, as presented in the next figure. Fig. 22. Duro-Bilt "20-Piece" 1/2-Drive Socket Set, 1930. Fig. 22 shows a Duro-Bilt 20-piece 1/2-drive socket set, consisting of a No. 660 L-T convertible handle, 15 hex sockets, three square sockets, and a screwdriver socket. 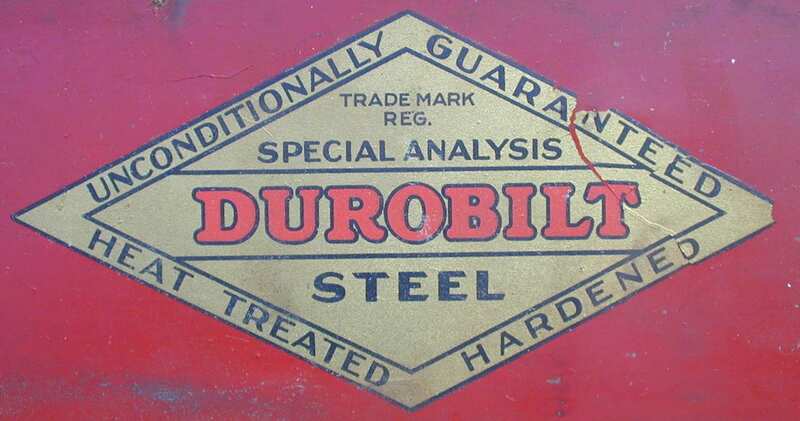 The set is marked with a Duro-Bilt decal on the inside lid, badly chipped but still mostly readable. The decal is printed with "DuroBilt" and "Special Analysis Steel" in the center of the diamond, with "Unconditionally Guaranteed" and "Heat Treated Hardened" along the borders. Readers can refer to the DuroBilt Decal shown with another set for a more readable example. The No. 660 L-T handle in the set is basically identical to the Duro No. 660 L-T Handle shown in a previous figure. The hex socket sizes are, from the left in front, 11/32, 3/8, 7/16, 1/2, 9/16, 19/32, and 5/8, and from the left in back are 21/32, 11/16, 3/4, 25/32, 13/16, 7/8, and 15/16. The large hex socket at the back left corner has size 1-1/8. The three square sockets in the main compartment have sizes, from the left, 3/8, 7/16, and 1/2. All of the sockets are stamped with the fractional size, but only three of the original sockets are marked with the Duro D-Trapezoid logo. The finish is nickel plating. The nickel finish of these tools provides a 1930 estimate for the production year, based on the nickel finish noted in 1930 Sears catalog, but with cadmium plating noted in the following year. This set is also displayed as the Duro-Bilt "20-Piece" 1/2-Drive Socket Set in our article on Duro/Indestro, which has further information on the tools and sockets in the set. This next figure shows an example of a Hinsdale socket set believed to have been the first alloy-steel socket set offered by Sears, based on the listing in the 1930 Sears (Spring-Summer) catalog. Fig. 23A. Hinsdale 1/2-Drive Chrome-Nickel "Mechanics" Socket Set, ca. Late 1920s to Early 1930s. Fig. 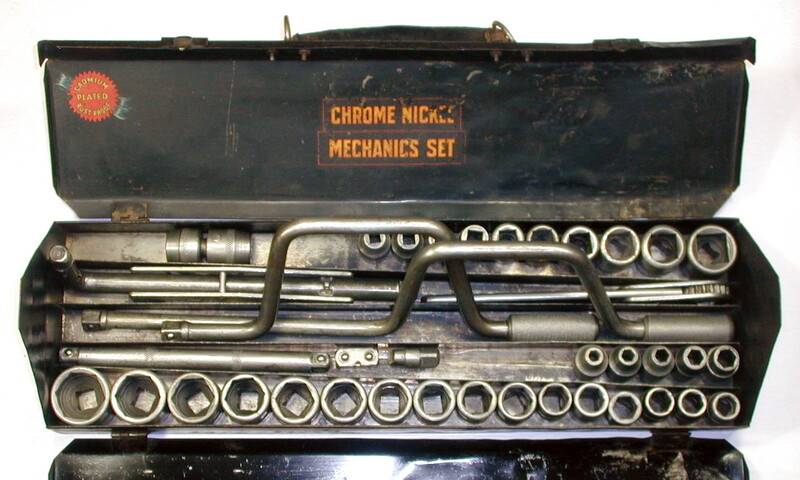 23A shows a Hinsdale 1/2-drive chrome-nickel "Mechanics" socket set in its hip roof toolbox with fold-out covers. This extensive collection consists of long and short speeders, a ratchet and drive plug, a TL-1 handle, an extension, a universal, a screwdriver bit, 21 hex sockets, and 10 square sockets. Fig. 23B. Hip Roof Toolbox for Hinsdale "Mechanics" Socket Set, ca. Late 1920s to Early 1930s. Fig. 23B shows the hip roof toolbox for the Hinsdale "Mechanics" socket set. This set has been identified as the Hinsdale "46-Piece Mechanic's Socket Wrench Set" listed on page 858 of the 1930 Sears Roebuck (Spring-Summer) Catalog. The catalog listing notes the hip roof toolbox and the inventory of tools matches well, including the 21 hex and 10 square sockets of alloy steel. The same set was listed again in the 1931 Sears (Spring-Summer) catalog. Based on a review of the Sears catalogs, this Hinsdale set appears to have been the first alloy-steel socket set offered by Sears. This set is listed in our article on Hinsdale as the Hinsdale "Mechanics" Socket Set, with additional photographs and information.